The problem is remembering them. At my house they are usually sitting in the garage right outside of the backdoor. They are there because I have actually used them, unloaded groceries and then set them there. It is when I am standing in the checkout line at the store and remember that they are all still sitting next to the backdoor in the garage that I really get frustrated. Not only am I not helping the environment when I forget them, I am adding to the pile of plastic I need to remember to take back to the store to recycle and I am missing out on the .5 cents (some stores give .10 cents) per bag that my grocery store gives me when I use my own. The thing is .5 or .10 cents would never normally move me to do much, but I do love knowing that the store is paying ME to use my own bag. So how to remember my bags EVERY time I head to the store. Here are a few ways others try to remember their bags. Keep the bags on a hook near your door. Keep a note on your door to "Remember your bags"
Purchase a bag that is small enough to hook on your keychain. 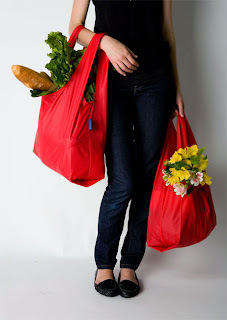 Purchase bags that can be rolled up and carried in your purse. Use a large bag that is fashionable to carry everywhere. And last but not least, check out this YouTube video by a British comedian, Tim Minchin about 'taking your canvas bags.' Maybe you can get the catchy tune stuck in your head as a reminder. Please feel free to share any other methods that work for you! I also own several and the minute I've unpacked them, I put them back in the trunk of my car (there's an entrance from the garage into the kitchen, so it's not a mission). Stores in South Africa don't give away free plastic bags - you have to buy them. But it's not about the money, it's about the waste. I love my reusable bags and feel very virtuous using them! Good pointers! I usually have them in the car and then I forget to get them out (duhh)..Great post!